This week I’m still on a quest for colorful outfits. Because now it’s May and guess what, the skies are still gray. Happy May Day! Gym clothes don’t have to be expensive. When you really think about it, these are clothes that you are putting on knowing they will end up sweaty and stinky every day. If you don’t have the money to buy The North Face and Under Armour brands, don’t sweat it (pun intended), you can still exercise! Don’t get me wrong, the class I attend is intense. But I also know my limits. And my instructor is motivating and positive. I’d like to leave the days of screaming coaches in my past, thank you very much. What can you expect at boot camp? Lots of movement-my heart rate goes higher than it does in my cycling class (although both are GREAT heart workouts). And strength training, which I really appreciate. Most girls don’t realize how important strength training is. Keeping those muscles strong burns more calories than cardio, changes your body shape (read- less cellulite and fat) and keeps your bones strong (so we don’t end up all hunched over in our old age). This time of year, I like to wear capris so I don’t overheat. These are from Forever 21 which has really fun, inexpensive workout clothes in lots of great colors. I also love a headband so I’m not constantly wiping away all of my sweat. As far as shoes, any cross trainer will do. If you want to wear running shoes, that’s fine too. The point is, get those clothes on your body and show up. You won’t regret it once you do. This is going to be a strange diversion from the norm. But I feel compelled to write this post, so you’re gonna get it anyway. I’m not a small-sized girl. I think from most of my blog posts, you can understand that I’m not a size zero. Nor am shopping in the plus size either. I’m somewhere in-between. I think many of you girls are like me. The average size of an American women in fact is a 14. And for those of you who fall greatly under that size, this post may mean nothing to you. For the rest of us, I can totally relate to size struggles. I’ve been up and down and up and down. Many of us mothers have been. We have our pre-baby, right after baby, in-between baby and post-baby clothing. It’s hard. It really is to know what size we are and what size our goal is. Yes I know I weigh in at more than 40 pounds than what I weighed in high school. That’s the weight of my six year old. But I don’t feel unhealthy. Yes, I could eat better. But my blood pressure is great! And I exercise six hours a week. I can chase after my kids and pick up something heavy. So if I want to have a glass of wine and some chocolate, should I skimp on them so I can go down a size? And then get down a size and indulge a little and go right back up? My point…I guess I just want you all to know, I’m out there posting pictures of my post baby(s) body and I’m not ashamed. Having three kids at almost 15 pounds each was worth it. At almost twenty years out from high school, I know God didn’t intended my body to stay the same weight as I was then. I was just a girl and now I’m a woman. So I hope I inspire you girls out there who are in-between and beyond. Don’t get down on yourself for what the number says on the scale. It doesn’t make you who you are. Stay active and strive for health. But be happy being average- you are not alone. That was a great slogan wasn’t it? Unfortunately that’s just not always possible. Especially if you’re trying to get in a good workout. Today we’re talking deodorant. While we all have varying degrees of sweat levels (some of us sweat more than others), we are all equally concerned with how we smell when we do. Enter trial and error of deodorants. I tested this one out lately at the gym. Some of my co-exercisers might have been concerned I was smelling myself. Cue Saturday Night Live skit. But I was really just making sure that I was happy with how the deodorant was working. And I have to admit, my nose has been working much more lately than normal, so I could keep track of the smell factor. I don’t really like the products that go on wet like this gel but you can find it in solid form. I find they just make me feel sweaty before I’m even sweating. But it did an excellent job of keeping me smelling good through cycling and boot camp. I put it to the test. 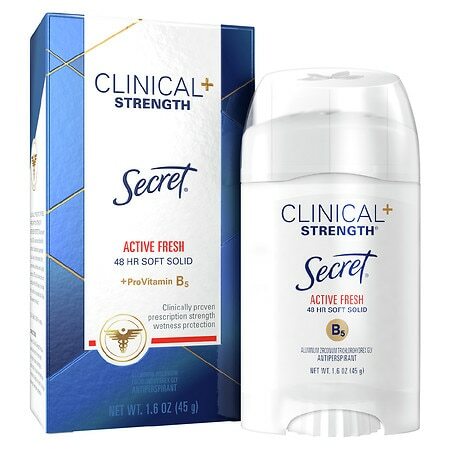 So, for my money, if you’re looking for a good hardworking deodorant, especially one that has workout strength, give this a try! I’ve said it before and I’ll say it again, you never have to worry if you’ve gotten a good workout in when you run. Don’t let those marathon runners intimidate you! Running doesn’t have to mean crazy long distances. It doesn’t have to mean doing sprints around the track. Running can be whatever you make it. If you’ve never run before, take it slow. Walk when you have to. Don’t let labels hold you back. No one should ever have to say, “I’m not a runner.” Anyone can run. And any activity is better than the couch! Think of how great it feels when you’re in motion; it’s flying with your feet on the ground! If you plan on running in the winter, be sure to avoid the ice. But even snow packed trails can be manageable. Just be careful and dress appropriately. My hands and head tend to sweat the most, so investing in some running gear may be worthwhile. And don’t dress too warmly, or you’ll be shedding layers. I’m excited to try snowshoeing this winter. It would be a first for me but I liken it to cross-country skiing. I’m anticipating wearing warm layers because I know that this will be a great workout and once I start exercising, I’m going to sweat. Fleece-lined leggings and moisture-wicking socks will help keep me warm. Online they recommend light-weight running shoes that are flexible to wear with your snowshoes. And don’t forget the ear warmers (a hat might be too hot) and some wool gloves. What a great way to workout and try something new! One of the very first occupations I ever remember wanting to be when I was very young was… an Olympic ice skater. I can remember watching the Olympics and being mesmerized by the figure skaters. Even before I knew how tall I would be or if I could be athletic enough, I pictured myself alone on the ice. This was a very unrealistic dream for a girl who learned to ice skate on a gravel road that froze over. My idol (besides Mary Lou Retton- who wasn’t excited about her gymnastic abilities?) was not an American. It was the East German….Katarina Witt. I looked at her body and saw some of myself in her. She wasn’t built like most of the other figure skaters. She had very strong legs, muscular quads and dare I say, a little bit of a behind (which I have no doubt is all muscle). She was a powerhouse. While I don’t think she is a great role model in her personal life, I do think she showed this young girl that finesse, athleticism and femininity comes in all shapes and sizes. Pretty profound really. What does any of this have to do with my blog? Well, in preparation of the Olympics (still a few weeks away), I’m going to do a week of fitness apparel. We’re all focused on being healthier this time of year and I’d love to encourage you with some exciting workout clothes. More importantly, I hope to encourage you to watch the Olympics with your kids. It will show them what hard work can accomplish, feel the adrenaline rush of competing and more importantly give them role models of all shapes, sizes and colors. Who knows what the Olympians of this year may inspire in them!